Thanks in part to developer Michael Ross, the Volunteer State is becoming a place where people are planting their roots and enjoying the scenery, weather and lifestyle that East Tennessee golf can provide. 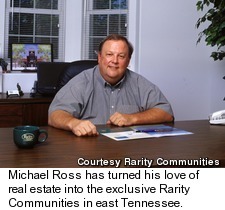 Ross, the founder and president of Rarity Communities, has plenty of experience when it comes to Tennessee. His family has spent the last six generations there, after all. And while the family business beckoned, it was as a developer where the 58-year-old Ross made his mark. "I've been involved in real estate investing most my adult life," said Ross. "My family was in the furniture business and I did that for a while." After buying and selling his first property in Louisville, Ross's path was set. And as the years have gone by, Ross has truly made a name for himself, and for East Tennessee, living with his ever-growing Rarity Communities. It was in 1990 that Ross decided to shift his full focus to developing properties, and Rarity Communities was born four years later. His company quickly put its focus on high-end land development, all the while staying true to the natural environment of the land. In keeping with that, Ross and his company have worked in partnership with the Tennessee Valley Authority and the Tellico Reservoir Development Agency to preserve the waterfront integrity of the valuable land he has chosen to develop. As Rarity Communities continue to grow and evolve - currently there are seven in stages from fully developed to still under construction - Ross has stayed true to building communities that are both at one with their environment, as well as having a consistent look. "We have established design guides and have been stringent in holding to those so every community has its own look," said Ross. "They all have different amenities. We try and create an inclusive atmosphere." Rarity Bay is a perfect example of Ross's philosophy. Located in the foothills of the Smoky Mountains, Rarity Bay has a centralized location that puts its residents just a couple hours drive from Atlanta, Lexington, Ky., and Knoxville. It's a community designed to take its residents away from the problems of city life, but still keep them in touch. And like the other Rarity developments, Rarity Bay sees its residents come from all over the nation. "Generally most folks are from out of state," said Ross. "We have several Tennessee residents, too. It's a good group. We get some local knowledge, some national knowledge and even some international knowledge." Like other Rarity Communities, Rarity Bay, which is in Vonore, Tenn., offers its residents a plethora of activities and amenities. Developed around Lake Tellico, boating and fishing are popular activities, as well dining and fitness. Ross said he's happy to keep up with current trends, where health and wellness are a bigger part of people's lives. "Obviously health is an important thing for people," said Ross. "We're doing wellness centers that's a component in the new communities. And all our communities have a fitness center." Golf, however, remains a big draw at all the Rarity communities. Golf course architects D.J. DeVictor and Peter Langham combined to build a scenic championship course for Rarity Bay, and Ross has reached out to some of the biggest names in all of golf to help develop golf courses at his other communities, like Rarity Mountain, Rarity River, Rarity Pointe and Rarity Club. Rarity Club, for instance, will have a golf course designed by legendary PGA Tour star Lee Trevino. Ross said that Trevino's attitude and energy made him the perfect person to design a course that will take advantage of lakes, rolling landscape and great scenery. "We were doing a planning session. That became a consensus of someone we wanted to be involved with," said Ross. "He's a great guy and has a great personality. 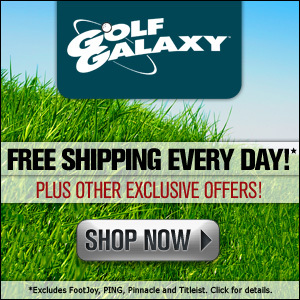 We think it's a great fit for our customer base." But Trevino is not the only big name who will give Rarity Community members a world-class golf course design. 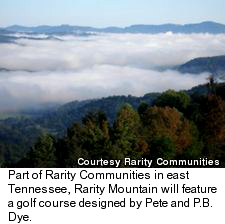 Pete and PB Dye are working on a course at Rarity Mountain and also planning on working on a course at Rarity Rivers. Overall, Ross is making a large commitment to golf over the next few years. "Right now we have two golf courses open and two under construction. And one more that will begin construction soon," said Ross. "We'll have five open pretty quickly in the next couple years, and we have four others in various planning stages. "You're always looking for innovative approaches. We're developing a collection of golf courses where anyone that lives in any Rarity community can play any other Rarity golf course," Ross added. With golf, a commitment to the environment, and a community atmosphere to go along with his eye for developing property, Ross and Rarity are a growing force in east Tennessee, and it seems the best is still to come. "We think we've got some great communities. We have got a good product, and we're always looking for opportunities," Ross said. Podcast: Hear Michael Ross on "TravelGolf.com This Week"